This entry was posted in Food, Roasting, Soups and tagged Dinner, Easy and Healthy soups, kid friendly, Low calorie, Make Ahead Meals, mediterranean flavors, Mediterranean vegetables, multi-use recipe, roasting vegetables, Vegetable soup, Vegetarian by bitsandbreadcrumbs. Bookmark the permalink. Mmm. Bet that is yummy! Love this soup Betsy!! Roasted veggies are so delish and would definitely make a fantastic soup. I too am a soup gal. For some reason lately I’ve been on a soup quest. Although, it could be because our weather turned cold but also one of my clients returned from Africa and raved about the soup. So now he’s decided he wants me to prepare lots of soups this week and next. Hahaha! Hope you’re doing well! Hugs! Hi Karista, and I’m so glad you like this soup. It’s so simple, there’s just no excuse not to make it. A soup quest…I love that! I’m redoing my web site again and haven’t had a chance to get around and visit this week…I need to see what’s cooking at your place. 🙂 Hugs to you, too! Happy souping. You’re so welcome! 😉 I hope you enjoy, miss c.
Thanks Alberto…and yes, autumn in a bowl I think. That’s a great soup Betsy. I usually press my creamed soup through a fine seive for a velvety smooth finish and our Lyon Chef diggested that running the immersion blender through it just before serving with aerate it and make it very light in the mouth! And I totally agree this fall weather is soup weather for sure! Hi Eva and thanks for your comment. I agree that a true creamed soup is best run through a sieve to get that velvety finish. I hadn’t heard of aerating it again, so that’s a great tip. This soup has no cream of course, and is of a more rustic style, so I used the stick blender just to blend it, and left a little of the texture of the vegetables. I hope this becomes a series for I shall be the recipient of all that veggie goodness! This does sound easy, and it looks delicious! I’m on a soup roll too Betsy. While I haven’t been able to “sell” the girls on roasted veggie soups, I adore them. I love the concept of adding mediterranean flavours to this soup too. Fall in a bowl indeed. Hey Barb…I’m surprised that your girls don’t like roasted veggie soups, actually. Your two seem so cosmopolitan in their tastes to me…a compliment! Ooh, roasting the veggies before making the soup – delicious! I can almost taste the rich full flavours. mmmm yum!! i love anything with roasted veggies yumm – looks simply terrific! Thank you, Beccysfoodies. Like you, anything with roasted veggies gets my attention! Beautiful photo of the soups and bread at the top. Your roasted vegetable soup is so summery with all of the tomatoes and summer squash. I ate butternut squash soup for lunch, even though it is eighty degrees today here (had to eat it before it went off). Thanks, Sharyn! I love to roast butternut squash and use it for salads, risotto and in the soup I mentioned in this post, amongst other things. I can’t eat pumpkin, so it’s a good substitute for me. 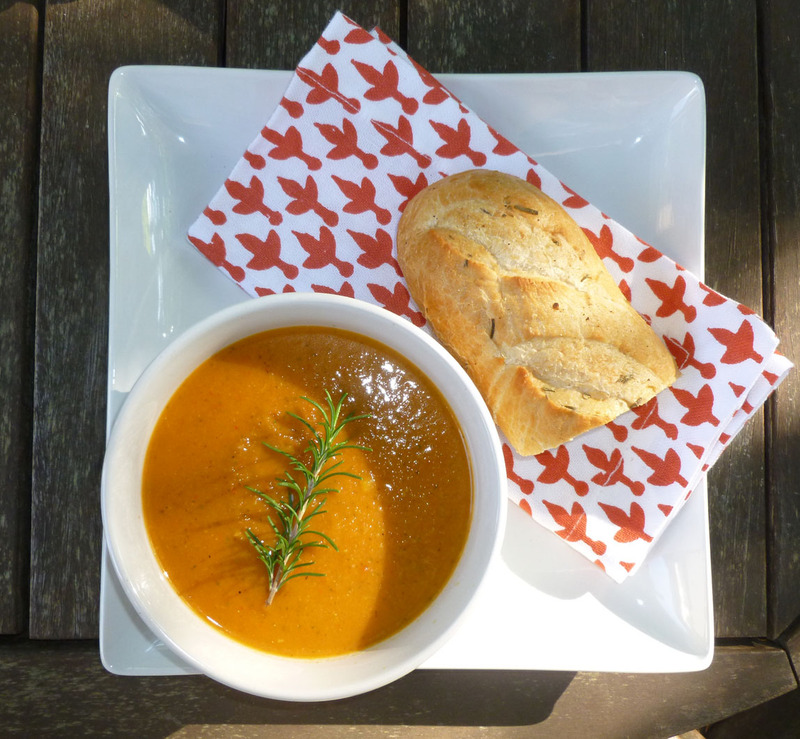 And yes, this soup was probably the last taste of summer…even here. Thank you for your lovely words – it´s one of the great things about blogging, the inspiration and the new friends! 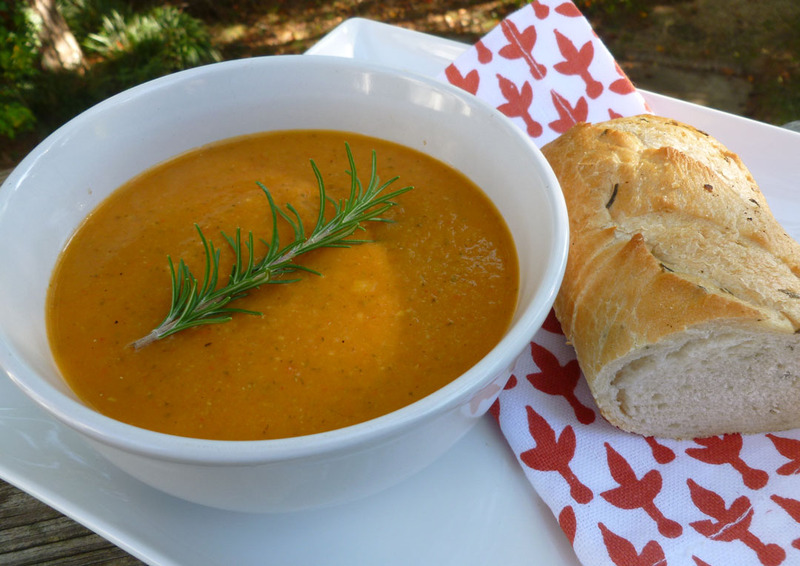 Thanks for sharing the link for the butternut squash soup! I just bought a squash the other day and I think it’s destined to become that soup. Oh yeah, soup and bread baby! So good – come hither indeed :D. I’ll eat bowl after bowl, and then slurp it directly from the refrigerator, cold, later on as a snack – yep, I’m a real classy guy! Gorgeous colours Betsy! Ha, ha! Actually this soup is good cold, but better hot! 🙂 I know, soup and bread, hard to find a more perfect food combo in some ways! Okay maybe chili and cornbread, which we had tonight, but you know what I mean. 🙂 Have a happy weekend, Charles! I have made similar soup but never thought of roasting the veggies first, what a great idea. Love the color..
Hi Norma, this is my second roasted veggie soup, and now I’m addicted. Really does add a huge amount of depth to the flavor. Thanks!!! Have a great weekend. It always says come hither to me too! Love your blog. Your recipes make me feel warm and cozy!